John Meehan, a pioneer in pediatric robotic surgery, is used to speaking at medical conferences. But when he traveled to Russia in August for a meeting of pediatric surgeons, he was thrust into an unfamiliar spotlight. A TV crew with the Russian National News Agency shadowed him on a tour of a 120-year-old children’s hospital in Irkutsk and, at the end of a two-day meeting, he participated in a press conference with seven TV crews and 10 photographers. “I had no idea how much attention my visit was going to bring. I thought I was going to another meeting," said Meehan, a University of Washington associate professor of surgery and surgeon at Seattle Children’s. C.K. Yeung, a pediatric surgeon from Hong Kong, and John Meehan address a press conference in Irkutsk, Russia. Russians, he said, are very interested to explore robotic surgery for pediatric patients. Meehan has performed at least 500 robotic-assisted surgeries on child patients, encompassing 50 different procedures and accumulating more experience than anyone else in the world, he said. A one-time jet engineer at McDonnell Douglas, Meehan transitioned to medicine and, after completing his surgical training, worked at the University of Iowa. In 2002, he used a robotics platform for a surgical procedure and was told it was a first – not just in Iowa, but in the United States. Yury Kozlov, a pediatric surgeon from Russia, invited Meehan in 2014 to this year’s gathering in Irkutsk, an annual meeting called “The Stars of Lake Baikal,” named after the huge lake. Meehan and surgeon C.K. Yeung from Hong Kong were the guest speakers. Through a translator, Meehan gave four talks on robotic surgery and met Russia’s minister of health and other politicians who attended the lectures. 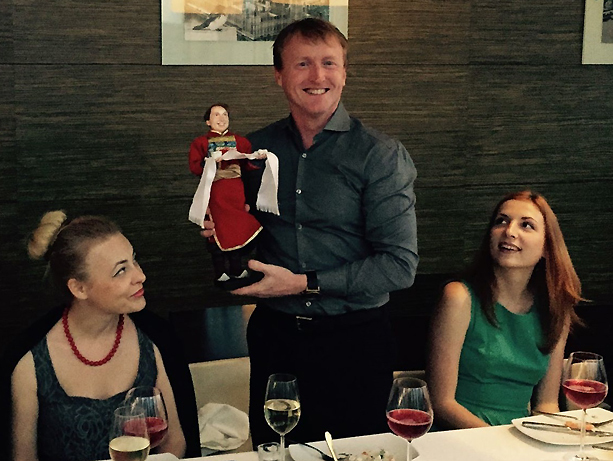 Meehan was also made an honorary member of the Russian Association of Pediatric Surgeons, was led on a tour of southern Russia and Siberia, and was presented a doll made in his likeness. During the talks, he presented examples of the many procedures that, with robotics platforms, can achieve potentially better results than conventional approaches. Many minimally invasive procedures involve small anatomic structures and delicate tissues. A robotics platform – in which the surgeon operates from a console several feet from the patient – can give a surgeon much more precise control of the instruments, Meehan said. Patients’ recoveries are often speedier with such procedures. The trip, his first to Russia, left him impressed with people’s hospitality and warmth, and physicians’ skills, too. During his tour of the children’s hospital in Irkutsk, Meehan said, he admired the “top notch” operating suites and the surgeons’ care of complex pediatric cases.